The Hawick Heritage Hub are providing an introduction to tracing your family history on 20th August at 2.30 pm at Galashiels library. It’s free but booking is essential. You can phone the library on 01896 752512. I've been experimenting with changes to the layout of this blog and this blog is to tell you what they are. I've had complaints that it's difficult to know when a new article is published. For those that use Facebook, each blog appears on our Facebook page. For those that use Twitter, the title of each blog gets tweeted - our Twitter handle is @BordersFHS. For those that don't use either, you can subscribe by email. Pop in your email and click submit. You'll get a request from FeedBurner (they deliver the emails) to verify your request by entering a rather annoying and difficult to read "word". They're rarely English words and they're difficult to read. 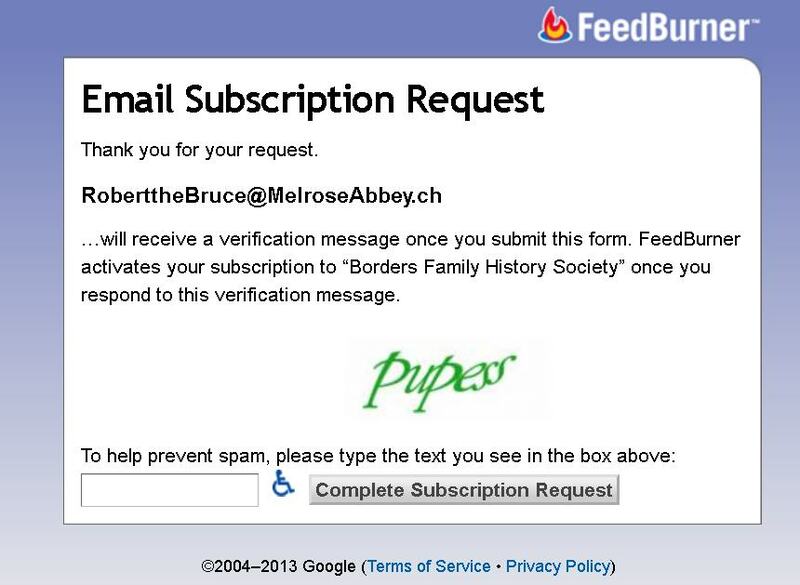 You'll get an email from FeedBurner Email Subscriptions with the subject "Activate your Email Subscription to: Borders Family History Society", click the link on the email and you'll get an email when we next publish. At the foot of the blog, there's 3 sections. 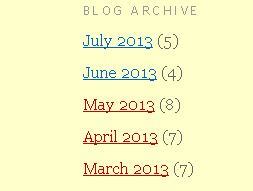 The blog archive by date - you can get to any past blog by clicking the relevant month and year. Links to our Facebook page and Twitter. The blog archive by 'label' (topic) - you can get to any past blog by clicking the relevant label. Unfortunately, I've discovered that people that use Internet Explorer 7 aren't able to access the blog - Internet Explorer 7 will either freeze, crash or produce an error message. Even worse, people that use people that use Internet Explorer 7 won't be able to see this blog, and people that can see it won't be using Internet Explorer 7. As usual, constructive comments and relevant comments are welcome. There will probably be more changes. When I blogged this yesterday, I got it wrong. 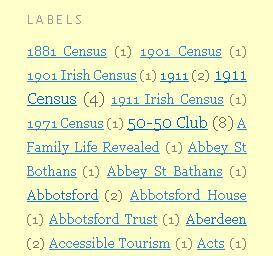 The access is only to the 1911 England & Wales Census, not the Scottish Census. Curiously, for Ancestry, England & Wales seems to include the Channel Islands and the Isle of Man. Of course, the lucky people who can get to the Scottish Borders or Edinburgh can use Ancestry in the libraries for free. Ancestry is offering free access to the 1911 England & Wales Census records until midnight on Sunday. Thanks to Marjorie Gavin for spotting this. Work towards transcribing all the gravestones in the Borders continues and this coming week-end we shall be back at St. Andrews Churchyard at Peebles. This is a churchyard which does present quite a challenge to us both because of the number of stones and the age and condition of many. We did make a start on transcribing last year but were very unlucky with the weather. For the moment at least though, things look a lot more settled so hopefully a lot more progress can be made. We shall be transcribing on both Saturday and Sunday next (20th. and 21st.) from 10.am. to 4.p.m although it is by no means necessary to be there for both days or even for one full day - just a few hours assistance can be very helpful and much appreciated. Even if you have not been involved in transcribing stones before, do consider joining us, as training is available and we like to think we are all helpful. Please also bring along a notebook and a pencil and also useful a soft brush, chalk, water spray and a kneeling mat. We encourage members to bring a picnic - a chance to socialise and meet with fellow members. However if preferred - the Neidpath Inn is a few minutes walk back towards the town and does bar lunches. Beyond the Neidpath, Forsyth the Bakers has a shop.... with a Coop store just beyond that ....and beyond that is Rambler's cafe, part of the Castle Warehouse store - window on to the street. ... next If you are looking for something special - just round the corner from Ramblers is Cocoa Black on the Bridge - award winning chocolatiere with cakes and sandwiches as well. Plenty of choice. There are public toilets at the entrance to the park across the road although fairly basic. From all routes (except Glasgow!) turn right at the Church at the end of the High Street and follow the main road. The cemetery is on the right hand side opposite the entrance to the Park/medical centre. It is about a 5 minute walk from the end of the High Street. There is parking at the cemetery entrance and a large car park just beyond it on the right hand side. These gates have been closed recently for maintenance/repair but should now be open. 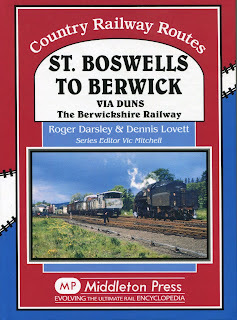 If not access from the St. Andrews Road or Wemyss Place entrances. Above is an image of the grave of the family of John Buchan, 1st. Baron Tweedsmuir the renowned Scottish author and later Governor-General of Canada. 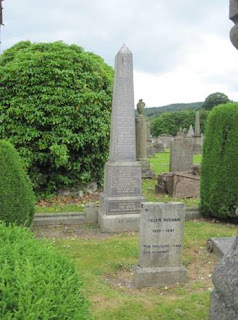 John Buchan although born in Peebles is not in fact buried in the family grave. He died suddenly in Canada where he was cremated, his ashes later being buried at Elsfield Church near Oxford. The society was recently very pleased to receive a delightful little volume on John Buchan's grave written by David Weekes. Ever since his remains were unearthed in an archaeological excavation on a city council car park once occupied by Greyfriars, Leicester, we've been curious about how his remains were unearthed and how his identity was deduced. 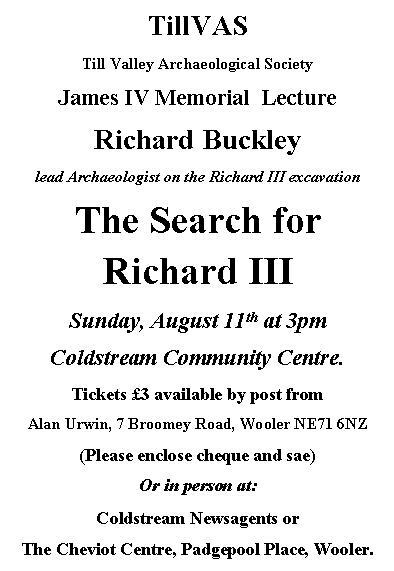 Till Valley Archaeological Society have arranged for Richard Buckley, the lead archaeologist on the Richard III excavation to give a talk 'The Search for Richard III' on Sunday, August 11th at 3pm in Coldstream Community Centre. 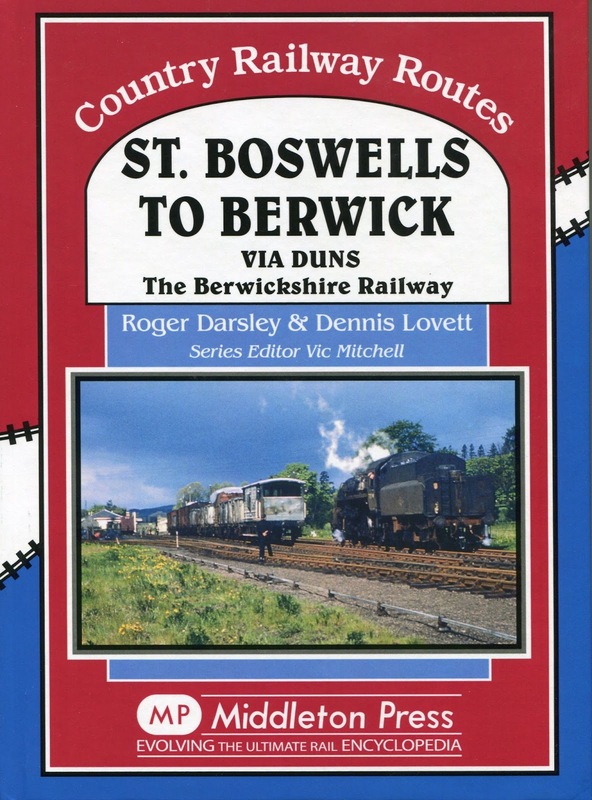 Tickets are £3, available by post (please enclose cheque and sae) from Alan Urwin, 7 Broomey Road, Wooler, England, NE71 6NZ or from Coldstream Newsagents or The Cheviot Centre, Padgepool Place, Wooler. the decisive battle of the Wars of the Roses. Tickets are likely to sell fast, so apply soon. I just discovered that Ancestry were providing free access to the 1940 US Federal Census until the end of today (but that's probably 7am British Summer Time). I hadn't realised that the 1940 US census was available and I thought I would find where great uncle, Arthur Zentler, was living but he's not in it and neither is his daughter, Ruth, or his wife, Ida ! I commented on this to my brother and he told me that Ruth was studying chemistry at the Sorbonne in Paris, France when World War II broke out and she had to flee the country via Portugal, so perhaps her parents went over to France to help her leave and that's why they're not in the 1940 US Census. So that's another story to research. However, I did find the man that Ruth later married, so that's useful. 2 people have reported problems this weekend when visiting the Borders Family History Society site using Internet Explorer. I've made a change that I hope corrects these problems so that the text is readable on all pages however I hope to make another change to progress the site so that it looks more like the old Borders Family History Society site. That’s the kind of question I have to cope with from my grandson, now in his last year at school studying maths and physics. I’ve even deserted my Iain Banks & Lee Child books in favour of Brian Greene, “The Hidden Reality” (well hidden indeed for a pensioner), to try and repair our communications! In the latter book the author always chooses the difficile word (see, it’s catching), so in recent genealogy correspondence when “Ahnentafel” was mentioned I thought 'here we go again; or have I missed a village near Dumfries where I was born' ? As it turns out, I should have known about an “Ahnentafel”, being a keen genealogist, everybody in the Society should know, so here goes, with the explanation. 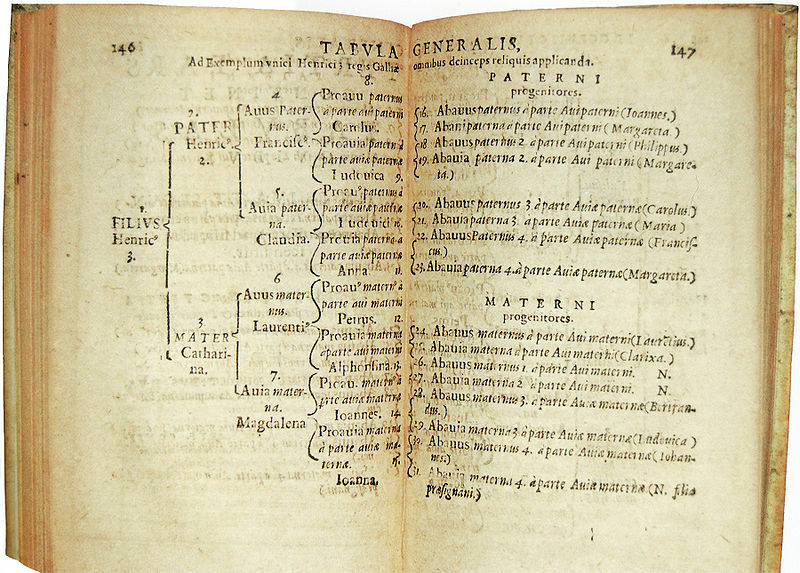 An “Ahnentafel” is a German word for “ancestor table” and is a list of one’s ancestors, so constructed, that it is easy to calculate the various relationships. 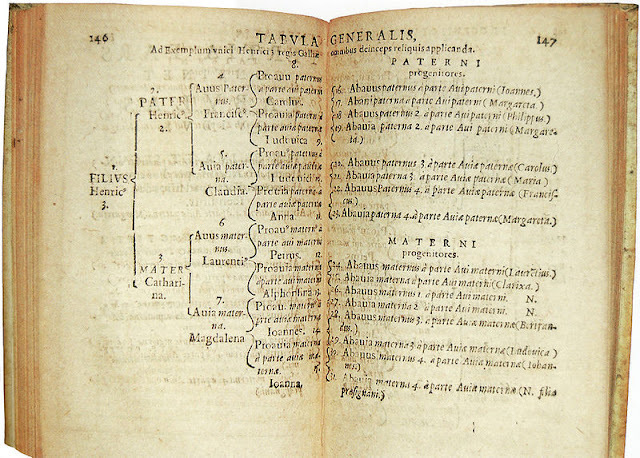 The first “Ahnentafel” was published by Michael Eytzinger in 1590 - see the illustration. He was an Austrian historian and the same numbering system is sometimes called the “Sosa-Stradonitz System” named after the Spanish and German genealogists, Jerome de Sosa (1676) and Stephan Kekule von Stradonitz (1896). In an “Ahnentafel” numbering system the base person is assigned the number one. The father of each person is assigned a number equal to double the child’s number. The mother of each person is assigned a number equal to double the child’s number plus one. As a result, the number of any child is one- half that of their parent, ignoring any remainder. Apart from the subject, who can be male or female, all even-numbered persons are male and all odd-numbered persons are female. Please no sexist comments! For the first four generations, the numbers assigned a given person and their ancestors reflect the following relationships. For the binary write down the digit “1”, this represents the subject, and, writing from left to right write “0” for each father and “1” for each mother in the relation, ending with the ancestor of interest. The result will be the binary representation of the ancestor’s “Ahnentafel” number. To simplify your calculation of the conversion, in “Google”, type in, 15 to binary, to get the answer 1111 etc. As they say in all the best books; for the “mathematically inclined reader” there are a number of websites where you can study the full application. I just want to bring this “Ahnentafel” system to your attention. This is a guest blog by Strath Stewart.